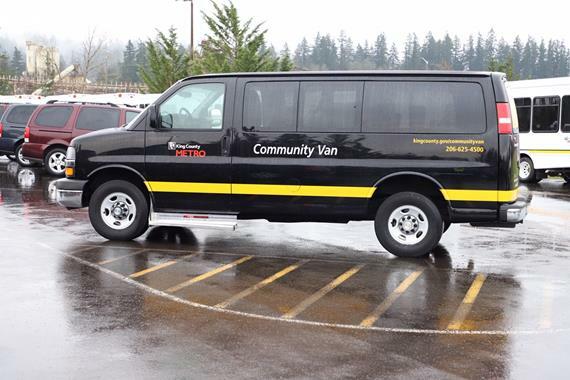 The new Shoreline-Lake Forest Park Community Van can provide group trips 24/7 and is reserved in advance. Group trip requests are made through a local Community Transportation Coordinator. This local, paid representative then finds a volunteer driver to fulfill the trip request and makes the transportation opportunity public to the community at large. The minimum group size is two riders plus a driver. The Community Van service is available to any resident of Shoreline or Lake Forest Park. The service area is flexible; reserved trips must simply originate within the boundaries of the cities of Shoreline or Lake Forest Park. This person-to-person booking approach has been successfully implemented by Metro in partnership with other communities such as Bothell-Woodinville, Vashon, and Duvall. Preschedule a Community Van trip by contacting Shoreline-Lake Forest Park’s Community Transportation Coordinator, Bree Boyce, at Communityvan@Hopelink.org. Make a new trip request at least 48 hours in advance of your desired trip. Riders wishing to join existing scheduled trips may join same day by contacting the CTC. Community Van is eligible for use 24 hours a day, 7 days a week. Community Van has 12 passenger or 6 passenger vans available, depending on group size. ADA-equipped vans are available upon request. All monthly ORCA passes, including transfers, are accepted along with mobile tickets via the Transit GO app. Drivers are unable to accept cash payment. Metro has also launched an evening shuttle service for Lake Forest Park and north central Shoreline called Community Ride. See the article.